It’s all about quality. That is the driving force behind everything we do at St. David’s Hydroponics Ltd. While we’ve been in business since 1985 and have grown to over 70 acres of greenhouses, we still believe in doing things slowly and correctly. And that’s exactly how we grow our plants. We don’t cut corners. This is why we use greenhouses. It allows us to control the environment and provide our plants with ideal growing conditions from the temperature to humidity and sunlight. Our growers have over 100 years of combined experience gained from training around the world. Their attention to detail and genuine passion for what they do is seen in the world-class plants they produce. We believe that our carbon footprint should be as close to zero as possible and in the summer months it is. We even use water gathered from the roofs of our greenhouses to water our plants. 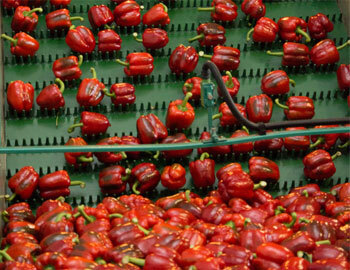 And once the produce has been harvested we carefully package them by hand to ensure consistent quality. This all takes place in beautiful Niagara Ontario. We love being part of this community. Niagara has provided us with the perfect location and climate to grow our product and has allowed us to bring together a team of passionate and dedicated people that love what they do. No matter how hard you work on your product it always comes down to the people that make it happen. So the next time you’re at your favorite grocery store remember to ask for St. David’s European bell peppers and eggplants, you’ll taste the difference.